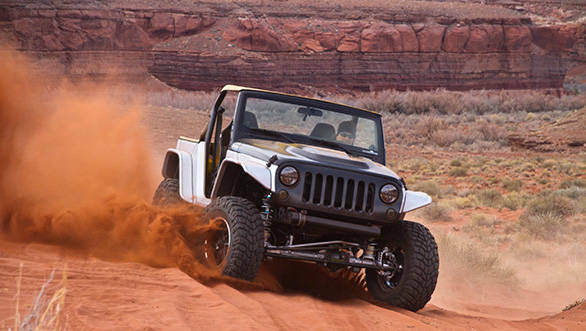 The Jeep Wrangler Stitch, which is based on the Wrangler Rubicon, was first of the four concepts we got to drive at the 2013 Easter Safari, a Jeep event that takes place in the Moab desert in Utah, USA. The event includes trail rides, usually a full day in duration that use Moab (the town) as base. This year, in all 30 trails were used and the event lasted an entire week between March 23 and 31. Also these concepts were actually used on the trail, and not merely confined to a display. Of the four concepts at the Easter Safari, the Stitch was the most impressive to drive - I was given the four for short on-road stints. Though I could have as many stints as I wanted. 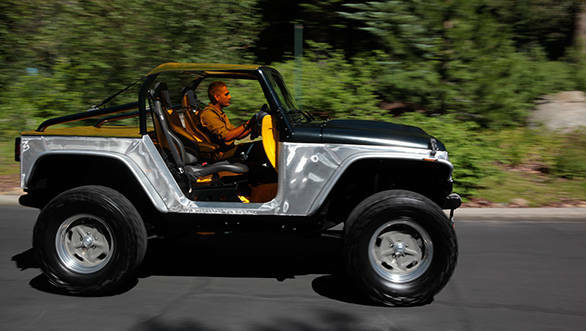 In essence, the aim of the new Stitch was to take off as much weight as possible from the Wrangler Rubicon. And nearly 500kg came off this car. The engineers took off metal everywhere possible to lighten the car, skinning the car in a silver nylon weave that, at first glance, looks like woven aluminium strands. The bonnet was then crafted in carbon-fibre to look like the sculpted hood of the Tenth Anniversary Rubicon. Similarly, the Dodge Viper donated the seat frames which were reupholstered for this vehicle. The dash looks completely stock but for the colour and in the interest of lightness contains nothing more than the wiper motors. The yellow top and the tonneau cover are both welding curtains and that just about rounds off this thing. There are, obviously, no doors or rear seats. Underneath the new skin, the Stitch gets a Mopar cold-air intake and exhaust kit, DynaTrac Pro Rock 4x4 axles with 4.88 gears, ARB front and rear lockers, King shocks, Tom Woods drive shafts and, of course, new 17-inch alloy wheels with 35-inch Mickey Thompson off-road tyres. How is it to drive? 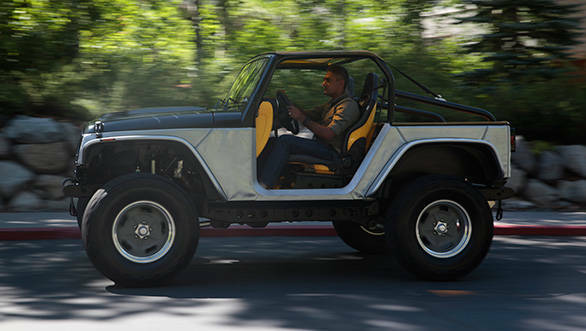 Despite its chunky off-road tyres, this is mechanically a stock Wrangler with the 6-speed automatic and the 3.6-litre V6. Pop it in drive and lay a heavy foot on the throttle and the thing takes off in a massive hurry. Kickdowns, similarly, produce great bursts of acceleration despite the transmission not being especially quick to shift. Jeep says it is even more impressive in difficult off-road conditions where the low weight makes the going a heck of a lot easier. The exact words were, "It skips over stuff that stock Wranglers work hard to get through."